Golf Distillery / Tweaks / Setup / Grip / Should You Use a Long or a Short Left Thumb Grip? 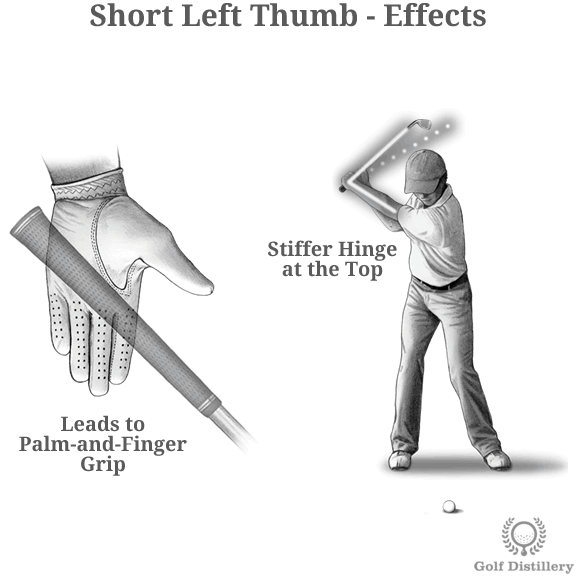 How a golfer grasps the club with his left hand can vary in many ways. Indeed, the position relative to the center refers to the grip strength and can vary between weak, neutral and strong. 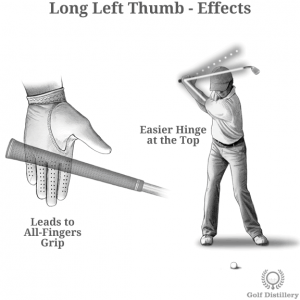 But additionally, how the golfer actually places his left thumb irrespective of how far to the left or right can also vary. Indeed, you can either adopt a long thumb grip or a short thumb grip. Both are explained below, as well as their strengths and weaknesses. 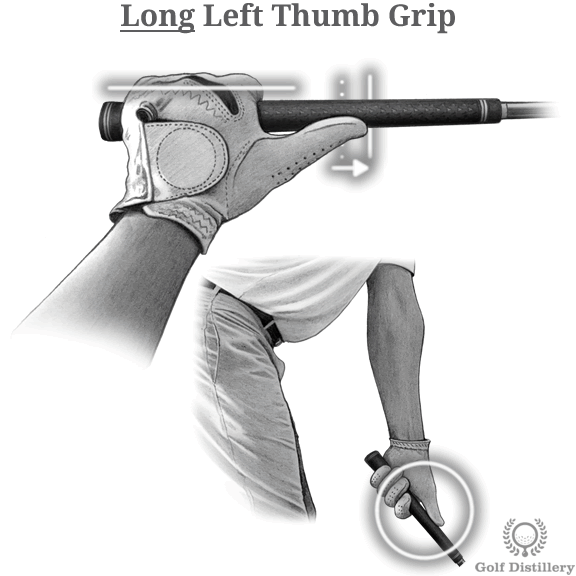 A long left thumb grip is recognized by its two main features. Firstly, the thumb extends much further down the grip than does the rest of the fingers. This fact is responsible for the name given to that grip. 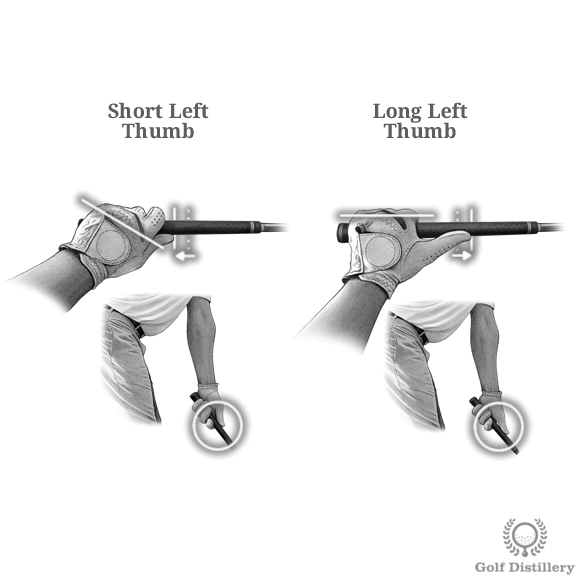 Secondly, a golfer with a long thumb grip will notice how the knuckles of his fingers are laying almost flat and mostly follow the line of the grip. A long left thumb directs the hands of the golfer towards an all-fingers grip in contrast to a fingers-and-palm grip. In that position and angle a full wrist hinge is much easier to achieve. Indeed, the club will reach parallel to the ground at the top of the swing with a more discreet wrist hinge than what would normally be required. This extended flexibility in movement allows for a bigger swing amplitude which in turn can lead to greater clubhead speed at impact. Such a grip is therefore particularly recommended to those looking to add speed to their swings and to those that experience limited flexibility in their wrists. A short left thumb grip is characterized by its two main features. Firstly, as its name implies the left thumb extends much less down the grip than it does in the long finger grip. 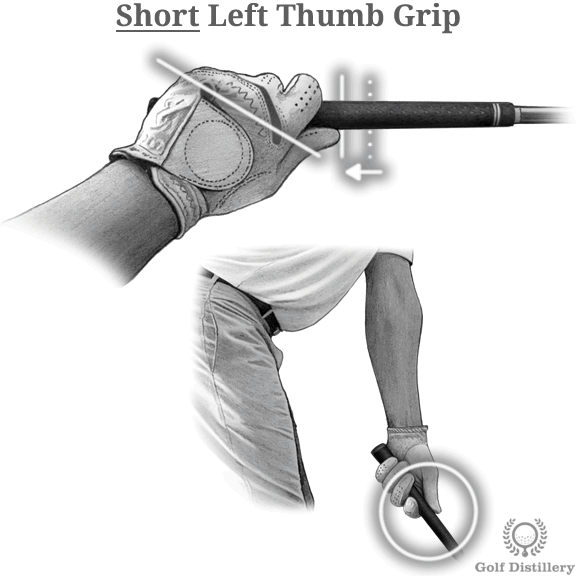 Indeed, a golfer with a short left thumb will notice how his thumb will extend barely past the other fingers down on the grip. Secondly, the knuckles will line up diagonally, crossing the grip of the club rather than line up parallel to it. Keeping the left thumb from extending down the grip comes at a cost of space for the rest of the left hand, which has no other choice than to be pushed towards a palm-and-finger grip. Indeed, it is quite uncomfortable to keep your left thumb short while retaining an all-fingers grip. A palm-and-finger grip makes it more difficult to see the shaft of the club reach the point of being parallel to the ground (or go past it) even when your wrists are fully hinged. In that sense, it may prove difficult to fully hinge for golfers who have flexibility issues. A consequence of this limited hinge range is that swings will be shorter with such a grip, at least in contrast to a long left thumb grip. Finally, a shorter swing will lead to a reduced clubhead speed but it may see an increase in consistency on the flip side.